IRISH CUP: Can Larne’s fortress help deliver an upset? If there’s one place Irish Cup enthusiasts look to for a shock on January 7, it will likely be to Inver Park. 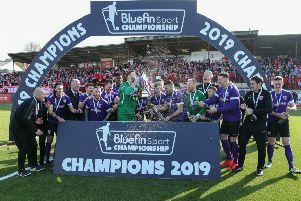 Davy McAlinden’s Larne have been drawn at home to the Premiership’s basement club Portadown. And although the Ports are in the midst of welcoming new boss Niall Currie, the Invermen have a proud home record to protect. McAlinden said: “The tendency is that a club gets a massive lift with a new manager. I’d expect Niall to make that contribution but we have won every game at home this season bar against Crusaders. “The Irish Cup is special so we’ll be hoping we can cause an upset. It’ll be good to welcome them to Inver and see if we can do that. “I don’t think it’s what you would call an expected upset but I would hope it’ll be a competitive game and we’ll always be looking to win. There are as many as four all-Premiership ties, meaning there will be some strong early fallers. McAlinden knows that could pave the way to an opportunity.